Something happened in 2018 that took a lot of people by surprise: Huawei, after its years of tinkering and P-series iterations, introduced the best phone camera on the market. For 2019, the P30 Pro wants to tear up the rule book and go one better. However, the Chinese company has been battling to hold onto its 'king of the camera phones' crown, what with Google introducing the incredible Night Sight mode in its Pixel 3, Samsung pushing multiple cameras in its A9 and great in-device processing in its Galaxy S10+, and Oppo teasing the possibilities of what's to come with its 10x zoom. The P30 Pro doesn't muck about though. By implementing a Leica Quad Camera system - which marries ultra-wide, super-high resolution and genuine zoom alongside a Time-of-Flight (ToF) camera - the Chinese company has succeeded in implementing the best, most versatile camera in any phone to date. With many saying the hole-punch camera would be the dominant force for 2019 and beyond, Huawei thinks different: the P30 Pro has a small 'dewdrop' notch front and centre (a bit like the OnePlus 6T). Thing is, the Huawei's screen choice, at 6.47-inches, is so massive that this little black-out area to the top where the front-facing camera is housed is barely noticeable. Flip a coin, really, it's six of one half a dozen of the other - we've barely noticed the difference between this and the Honor View 20 and its hole-punch camera during our full week of use. At least the Pro isn't a slider phone, which would make for a bulky, dust-grabbing form factor - although the P30's thickness is really apparent from the off. This phone is far chunkier than the P20 Pro, for the simple fact that the new phone houses a massive battery under the hood. It's 4,200mAh, which given how well the Mate 20 Pro proved in performance terms with the same battery capacity, is a great shout. The P30 Pro lasts for an age - but more on that later. Ultimately, the P30 Pro is a larger, beefier version of the P20 Pro that it replaces. That larger screen has a narrow aspect ratio, though, so it's easy to hold and puts it on par with the other sizeable screens we're seeing - take a look at the Samsung Galaxy S10+ as one obvious example. Despite this physical size, however, Huawei has foregone cramming more pixels into the Pro's screen - which we think could be taken as a mistake. Imagine being able to watch crisper streams from Netflix, or zoom into those photos with extra eye-popping detail? Samsung offers a 3040 x 1440 resolution, which it turns off by default for the sake of battery life - and Huawei could easily have offered a similar solution for the best of both worlds, going high-res only when really needed or requested (as it stands it has a smart resolution mode that uses an HD+ (1560 x 720) resolution when it can). 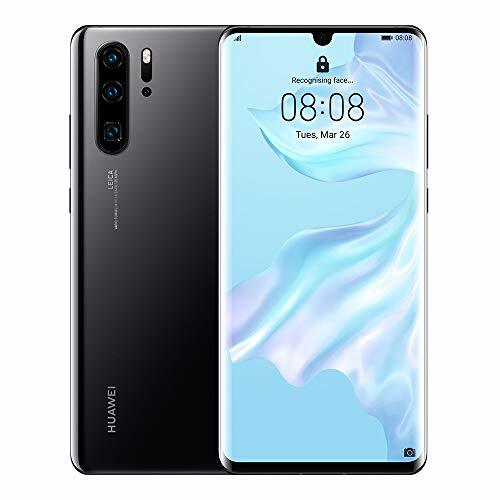 Huawei P30 vs P30 Pro: Which is best for me? Visually, however, the P30 Pro is a stunner. Shown here in its 'Breathing Crystal' finish - we know, marketing names have to be silly, it's an unwritten rule - it has a similar finish to its predecessor's gradient finish, albeit with a more pearlescent finish. It's a fingerprint magnet, though, as is to be expected these days, but keep it clean and that surface sure does sing. There is are more conventional black option, or if you're looking to go the opposite way then the orange Amber Sunrise is a hot look (well, maybe, it's not as lary as it looks in press photos - as we discovered when seeing some samples at the P30 Pro launch event in Paris). The design also embodies some new ideas. Look up by that dewdrop notch and you won't see a speaker crammed into the edge next to it, because the P30 Pro doesn't have one. Instead, by using magnets to create vibrations in the screen, you'll hear audio projected into your ear. We've seen and tested this feature before in the Vivo Apex 2019 concept phone - and it's impressive to say the least. It works just fine, too, as we've found in long-winded calls with our credit card company (buying these £900 phones brings inevitable financial woes, eh?) - which is a good job, as a device like the Honor View 20 sounds terrible by comparison given its speaker position. It does mean, however, that the P30 Pro's bottom-edge only speaker sees the phone lag behind some of its competition when it comes to audio. We weren't expecting gaming-quality stereo output as per the Razer Phone 2, but the Google Pixel 3 XL is notably better with its stereo setup and output than this Huawei. The P30 Pro also updates Huawei's in-screen fingerprint scanner offering with an optical solution. It's easy to register, quick and accurate to log-in - but not a patch on how incredibly fast that aforementioned Vivo phone is. Really, you need to look at our video to get an idea of the speed. At least in-screen scanners are now of usable quality, though, which shows how far Huawei has come in a short period of time - since the Porsche Design Huawei Mate RS and its so-so scanner. Now, on to the main event. The P30 Pro is really pitched as a camera phone. And it has a whole heap of interesting things to offer in this department. Principal to these is the so-called SuperSensing sensor which functions entirely differently to most conventional sensors. This is going to get a little bit deep, so hold onto your brains for a moment. Most camera sensors have what's called a Bayer array - a four piece grid that delivers red, green, blue and green (RGBG) light frequency adsorption to the pixel sites below, with the camera then able to decipher full colour information from these readings. Huawei has done away with this in place of a red, yellow, blue, yellow (RYBY) array. Why? Because yellow light frequency is more sensitive, thus can capture more information for a more detailed result. Now that's the theory, but it's the results that are really interesting. As the P30 Pro can do so much, we've broken this camera review section into sub-sections. For most, it'll be the quad camera system setup that's most interesting, because it's this variety of lenses that allow for greater versatility in capture. There's the 16mm wide-angle lens, as per the Mate 20 Pro, which squeezes lots into the frame. We love this wide-angle for the dramatism it can add to a scene - although the edges are softer than the centre by a long way and there's some colour shifting towards these peripheries too. Then there's an ultra-high resolution main sensor - it only captures 40MP when you tell it; 10MP is the default as it can super-sample for better results) - which delivers really detailed shots. Huawei is glutton for over-sharpening images, but in the P30 Pro the majority of the time the results are spot on. The key lens to the Pro is the lens that offers 5x optical zoom - plus a 10x digital zoom, which pulls on the data from the other main camera to assist with software enhancing the zoom result. The 5x optical zoom is mighty impressive, presenting a good level of detail considering the periscope zoom mechanism used. It's not pin-sharp at 100 per cent, but we've seen no other phone produce shots this crisp at an equivalent focal range (which, until now, has only been achievable by digital zoom anyway). Beyond 5x zoom things need to be taken within the context of a phone camera proposition though. The 10x hybrid zoom is fine - it's clearly not 'lossless' as Huawei claims, you only need to look at the frames in full size to see this - but the level of detail that's decipherable in this mode is impressive, even if it lacks genuine bite and sharpness. Beyond this, Huawei offers up-to-50x digital zoom. It's entertaining, but the results aren't really worthwhile for much, given how soft things become as a result of the upscaling. Nothing else on the market can compete, but it's the 5x zoom that hits the sweet spot. You might think you've never really wanted to use such a zoom, but the moment you begin to see the possibilities it brings, it'll be hard to move on to a phone with a camera any less sophisticated. It's great for candid shots and great for seeing different composition options. You might think so many lenses would lead to confusion, but the P30 Pro is really easy to use. Selecting between wide, 1x, 3x, 5x and 10x is as simple as tapping the on-screen zoom circle icon (with a prompt as to what the current zoom is). If you're more a pinch-to-zoom operator then that's also possible, making those zoom levels between 1x and 5x easily achievable (and we must admit, we do miss the standard 3x optical zoom of the P20 Pro in that regard). Huawei being Huawei, though, there are a variety of options available to toggle on and off. There's a colour setting - which selects between standard, vivid and smooth colours - and Master AI top and centre which uses learned data to auto-recognise scenes and adjust exposure, select settings and tweak colours as it thinks is best appropriate. Master AI definitely has its uses, but it's not always desirable. It will present the mode it believes is appropriate - such as Super Macro, Text, Blue Sky, and so forth - which you can deactivate on-screen by hitting a little cross next to the auto-selected mode. The camera is supposed to learn if its recognition is incorrect when repeat presses occur. But we've seen plenty of errors: our dining table was a 'waterfall', apparently, while we've seen fruit mistaken for 'moon' and other such comical capers. Many will like the simplicity that AI offers with its enhancement of exposure and colours, though, so we can certainly see why it exists. When it comes to shooting subjects up close, the P30 Pro can get really close. With the standard lens, we're talking just a few centimetres from the subject. But that's not all: the 5x zoom lens can also focus up close too. We shot our jeans and the result was detailed far beyond what the eye could see, with individual threads and fibres apparent - it looks like chainmail, when it's just woven threads. When out in Helsinki, Finland, a drink with the national berry, blueberries, in the glass was captured in extreme almost abstract close-up glory. The 5x zoom isn't bitingly sharp, as we've said, so look at these shots outside of their on-screen confines and there's not as much detail as you might think, but it's still impressive enough to blow away your mates by taking a few close-up snaps. A great feature of the P30 Pro is the very same as its P20 Pro predecessor: Night Mode. This option takes multiple frames at different exposures and combines them into a single HDR (high dynamic range) image. Although it's designed for use at night, we use it most in the day where it's possible to extract extra range from shots for added dynamism. Don't think of this like Google's Night Sight mode either, as it's not. It needs a steady hand - but you can shoot handheld using Night Mode, even in very low-light conditions, which is great. If subjects are moving then there will be some subject blur as a result, but if it's, say, people walking through a scene or clouds moving at pace then it actually looks great. When we first saw the P30 Pro we were disappointed that it had no equivalent to Google's Night Sight mode, i.e. the ability to shoot shots in very low-light conditions and use processing to render the shot in almost daylight-esque form. Thing is, we were wrong. Although it doesn't shout about it, the P30 Pro in its automatic mode is the best low-light camera on the market. And then some. We did some side-by-side shooting next to the Google Pixel 2 and the P30 Pro hands down wins. In a near blackout dark kitchen we shot our (admittedly scruffy) kitchen utensils draw and, despite not being able to see what we were shooting whatsoever, the Pixel in Night Sight mode hardly rendered anything visible, whereas the P30 Pro presented the full contents of the draw as if the lights were on (believe us, they were off). It's staggeringly impressive - and that's down to the SuperSensing sensor's structure. Now, the results in such extreme scenarios aren't going to be ultra-sharp or the most usable. But it spells out a future where artificial intelligence and image processing becomes a wholly different aspect of photography. Because the P30 Pro isn't using ultra-high ISO sensitivity to render these shots, it's using algorithms and processing the data it has available to generate images beyond what the eye can see. If you want to go a bit more detailed then a swipe to Pro mode gives control over all settings, including shutter speed and ISO sensitivity. However, the maximum selectable sensitivity in Pro mode is ISO 6400, which seems to render the higher sensitivities (ISO 409,600 being the maximum) as entirely obsolete. How odd. Furthermore if you use a high ISO sensitivity then, well, all the magic of that SuperSensing sensor is over-ruled and little processing occurs. A shot we took inside ancient walls on the island of Suomenlinna, Finland, shows up considerable colour noise, rendered as red, green and blue spots throughout the frame. A curious result, given how ultra-impressive the point-and-shoot mode's processing is - and that it's inaccessible in Pro mode! The fourth camera in the quad equation is the Time-of-Flight camera. ToF roughly works like Sonar, outputting a (not visible to the eye) frequency of light that bounces off its subjects and returns a time-based depth map of what's in front of the lens. That's a better way of deciphering exactly what is where within a frame, for more refined handling of depth data than systems that simply use multiple cameras (or even single ones). The P30 Pro's Portrait mode auto-selects a face and gives pretty good edging around subjects, while the user-definable Aperture mode (f/22 to f/0.95 on a sliding scale) has given us generally better edge definition than we've seen before - although it's not 100 per cent perfect. Still, such modes are an essential to a phone in 2019 and Huawei can be pleased with what it's delivered. Overall the Huawei P30 Pro has the best camera setup you'll find in any phone right now. It's untouchable. That said, there are some perplexing points: the number of modes available may become confusing, especially when the standard point-and-shoot mode is so good; the zoom is great to 5x but overstates its ability thereafter (and 50x is just silly); the optical image stabilisation is useful but needs to be better with these zoom options; and some simple issues such as colour inconsistencies between focal lengths is a minor letdown. Still, we're nitpicking. If the P20 Pro was the phone camera king then the P30 Pro is a phone camera god. In terms of performance, the P30 Pro arrives mid-term in the company's release cycle, which means the same Kirin 980 processor as per the Mate 20 Pro, offering a slight generational boost for the P series. All P30 variants - there are 128GB/256GB/512GB storage options - come with 8GB RAM too. As long-time users of the Honor View 20 and Huawei Mate 20 Pro, we've found the P30 Pro feels perfectly at home. It's a solid performer and every bit the flagship in terms of operation: the software runs smoothly, we've not had crashes or apps hanging, while games have performed free of stutter or problems. Huawei has long pushed its EMUI - that's Emotion User Interface - with the P30 Pro adopting a slightly updated version, EMUI 9.1, which is built over Google's Android Pie 9 operating system. We couldn't spot any massive changes here compared to the Mate 20 Pro - except the introduction of Digital Balance - but given how improved EMUI 9 was compared to some previous iterations, we think Huawei is in a place where its customers will find its offering and customisations to be acceptable. Not all will agree, though, with fussy pop-up alerts and Gmail breakdowns that Android purists may find irksome. We're not fussed either way, though, and don't think the software as it stands is any reason not to buy this phone. Whatever you make of the software - and we deep dive into EMUI 9.0 here, for a general overview of tips and tricks - the P30 Pro's battery really impresses for a variety of reasons. The 4,200mAh cell is massive and lasts for an age: on heavy use days including some hours of gaming we've hit 45 per cent remaining after 17-and-a-half hours of use. That's mighty impressive. The P30 Pro could easily be considered a two-day phone for sure. If the battery does run low then the 40W SuperCharge fast-charger in the box will fill up the battery in double-quick time. Indeed, up to 70 per cent can be topped up with just half and hour at the plug. There's also wireless charging and reverse wireless charging - the latter as first seen in the Mate 20 Pro - so you can top-up friends' phones or recharge your wireless earphones (although Huawei has still failed to introduce wireless charging headphones, despite also launching its new FreeLace model in tandem with this phone). With great design and colour options, immense battery life plenty of power and the P30 Pro isn't just a photography phone, it's arguably the best flagship phone we'll see in 2019. Any issues to speak of are minor - it's thicker than any P series phone before it, the screen lacks class-leading resolution, not everyone will love the software, the optical stabilisation could be better, some camera modes are confusing and colours in images inconsistent - but we're nitpicking really. Where the P30 Pro really excels is with its photography prowess. It's got the most versatile camera setup in any phone to date, so if the P20 Pro was the phone camera king then the P30 Pro is a phone camera god. It's untouchable. It might only have a single rear camera, but don't underestimate Google's power when it comes to software. With Night Sight impressing the world over and a simpler user interface than the P30 Pro - not to mention Google's cleaner, easier-on-the-eye Android software - the Pixel 3 XL is a great, great phone. Like the look of the Pro but want something smaller in scale, more affordable and without as much zoom? That's the P30's prospect. It comes with a 3.5mm headphone jack, too, which we think is a great re-appearance of a much-loved feature.